I once read about a mother who threw away her child's car seat and bought a brand new one because he vomited on it. I thought she was joking at first. Really? Just… throw it away? Child car seats are not the cheapest thing in the world and certainly not a piece of baby gear I would just toss and replace in that way. It got me thinking though – how do you clean that? When I asked my husband, he said “hose it off.” Umm, yuck. I really hadn't put a lot of thought into cleaning our car seat. It is sort of embarrassing to admit, but the thought really hadn't occurred to me. Obviously if my daughter made a huge mess like vomiting on it I would think to clean it, but other than that, it never crossed my mind. We clean the car and practically everything else she touches on a regular basis – why not her seat too? Crumbs in the car seat gather around the belt. The more I thought about it, the more I could see her plight. She couldn't just leave the vomit all over the seat, but to clean it would take quite a bit of work. During that time, the seat wouldn't be available for use. If this happened to me a couple weeks ago, we'd be stuck until the seat was washed and dried since we only have one toddler car seat. I wondered how often moms just threw away their car seats thinking they were impossible to clean? 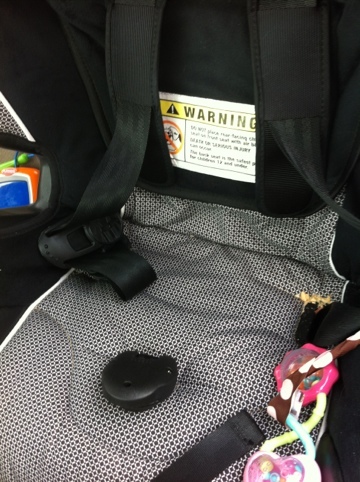 Thankfully a mother who is also a pediatrician recognized how dirty car seats can get from spills, spit up, vomit, etc. 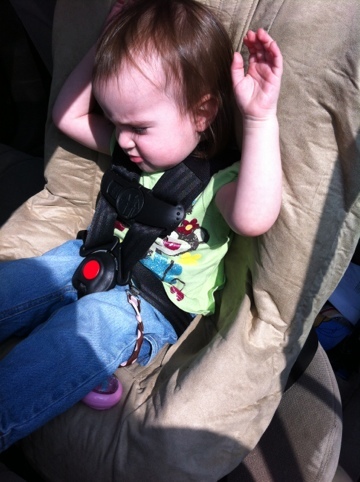 She also knows what a pain it is to try and get the cover OFF of the car seat. I don't even want to think about the nightmare it would be to get the cover off and then back on again for ours. It would probably involve rethreading belts and who knows what else! The easiest solution is to have a child car seat cover that goes OVER the car seat! This is exactly what you get with the S.A.F.E.R. Child Car Seat Cover. It is a soft, microsuede cover that fits over most toddler car seats (sorry, not for infant carrier seats). When it arrived and I took it out of the package I thought it looked complicated. The instructions were detailed, but I still felt a tad overwhelmed until I went to put it on. The S.A.F.E.R. Child Car Seat Cover stays in place really well too. I wasn't sure if it would start to slip down after getting Rissa in and out several times, but it has not budged all week! It's really fast and easy to remove too. If you have crumb problems like we do, be sure to tuck the sides in before starting to roll it up to keep them trapped. Even though it puts the seat to chance, it's nice that it is still functional while the cover is in the washing machine! I mentioned in the video that I am wondering if the gaps around the bottom belts will still trap crumbs. I haven't had enough time to evaluate that yet. However, crumbs are easier to deal with than bodily fluids, am I right? 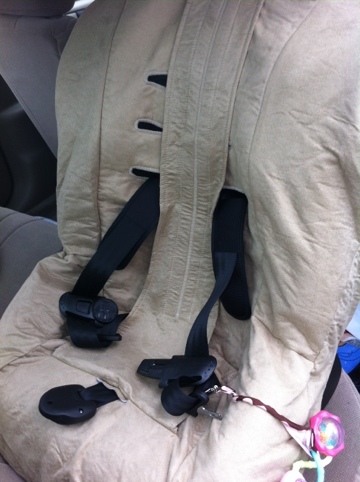 At $49.99 it is a bit of a higher price point, but will save your child car seat from unnecessary wear and tear. Plus it will promote cleanliness. I'd rather pay $50 for a cover than spend hundreds on multiple seats. It's a great baby shower gift idea! I do hope to see them come out with more color choices though. This tan looks okay in our car (it matches the interior quite well) and I didn't mind covering up this seat. However, I have a new seat coming that is a fabulous blue color! It'd be a shame to hide it. For more information please visit saferchildproducts.com, connect with them on Facebook, or visit Mompact.com. This is a product invented by moms, for moms! Please note: I am not making any claims about the safety of this product, only the effectiveness and ease of use for cleanliness. Please look into your car seat manufacturer warranty and any other information about after market products before choosing to use them. Each person must decide for themselves if they feel this product is appropriate to use with their car seat. I think this post was meant just for ME! I cannot even tell you how much I relate to needing this in my life. Definitely adding to the shopping list! Love the video too Darcy! Thanks so much for this post, from a mommy who lives in crumbs everywhere.